Today, Bugatti presented its Chiron to the public in Taipei. On the occasion of the premiere of the world’s most powerful, fastest, most exclusive and most luxurious production super sports car in Taiwan, Bugatti’s official partner in Taiwan, Yun San Motors, took the opportunity to inaugurate its Bugatti showroom in Taipei. The exclusive home of the Chiron in the Taiwanese apital features the new showroom design of the French luxury brand. Bugatti Taipei is the only Bugatti showroom in Taiwan. All in all, Bugatti has 34 dealers in 17 countries, including three in the Far East. With the introduction of the Chiron, the importance of this region as a sales market for Bugatti continues to grow. “We are extremely well-positioned to present the Bugatti brand to our guests in an exclusive, unique atmosphere which they could otherwise only experience at Bugatti’s headquarters in Molsheim,” Timothy Chang added. Bugatti Taiwan is located in the district of Neihu, the trading and technology centre of Taipei, where many other premium and luxury automobile brands also have facilities. 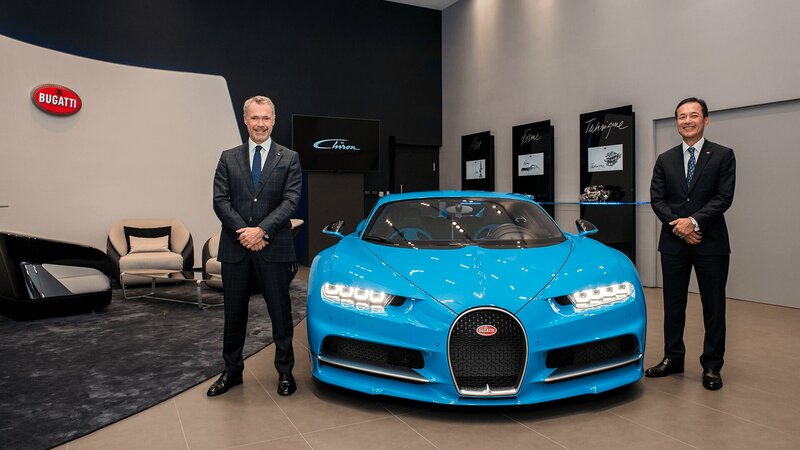 The showroom, which has an area of about 80 m² and is decorated in the shade of blue that is typical of Bugatti, is characterised by pronounced lines and clear surfaces. Exhibits explain 2 BUGATTIthe impressive technical details of the Chiron. Product information and highlights from the history of the Bugatti marque can be called up on a communications strip running along a curved white wall. In addition, customers can configure their new Bugatti in a comfortable lounge featuring furniture from the Bugatti Home Collection. The showroom also has a small lifestyle section with clothing and accessories from the Bugatti Lifestyle Collection. Yun San Motors was established in 2007 and is a renowned expert in the sale and servicing of luxury automobiles in Taiwan. The company has been Bugatti’s official dealer in Taiwan since 2015. Monday – Saturday: 10.00 a.m. – 6.00 p.m.
Dr. Stefan Brungs, Member of the Board of Management of Bugatti for Sales, Marketing and Customer Service, (left) and Eric Lin, CEO of Bugatti Taipei, presented the Chiron at the newly opened showroom in Taipei. © 2016 Bugatti Automobiles S.A.S.